Ice. What would a summer be without it? Backyard parties, picnics, soccer games, road trips - nothing would be the same. 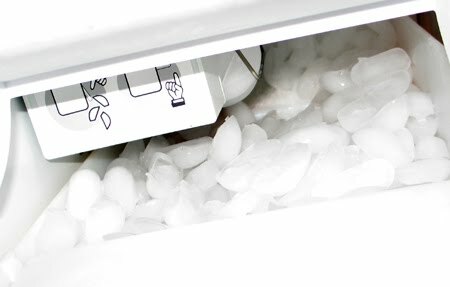 A night or two before a party I'm hosting, I'll fill a large storage container or two with the ice from my ice maker, then let it refill itself...until I have as much as I need for that occasion. Our freezer is rarely packed to the gills, so this works fine for us, but you can also fill plastic bags that can squeeze around your freezer food more easily. 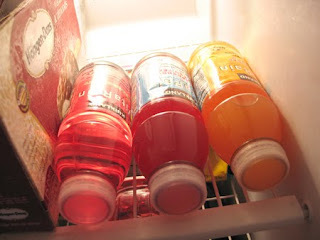 Then, I consider what's in the ice maker as my reserve. Plus the larger ice bricks don't melt as fast as ice cubes. 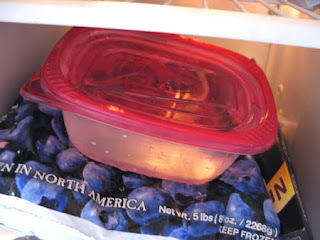 Also, I put ice cubes in gallon or half-gallon ziplock baggies, as they can cover more ground, so to speak, of the items you wish to keep cool, yet contain the water when melted. Our cooler used to have a basket that would hold little things above the madness below ... but I couldn't find it before our recent picnic outing ... note to self: check sandbox ... that also helps prevent the mushy labels. I pack condiments because I prefer sandwiches with fresh toppings - what about you? Do you put lettuce and tomato on before you head out, or in a little tupperware to be added right before eating? Wraps travel better and can be made longer ahead...with no bread to get soggy. What are your picnic tips? My thrifty ways balk at $20 beverage receipts at EVERY gas/potty stop on our road trips ... and with the four of us, those stops are frequent. So, a beverage cooler is a convenience AND savings. Plus if our travel destination is the beach, the convenience and savings continue. Please share your summer ice tips in the comments! What great ideas. You always share such neat things! Thanks for stopping by on my SITS day! Have a great week. Saying hi from SITS! Great ideas. Think you covered the best of mine and more.